200 mile snowshoe and toboggan trip that Garrett and Alexandra Conover are taking over the frozen waterways of the Maine North Woods. The route starts from Greenville Me, at the foot of Moosehead Lake, and ends in Allagash Village. The coldest morning was -33 F with no wind chill !!!!! and they're living in a tent, and looks like they live in a tent just about year round. A lot more Pictures >> http://gailandroger.com/public%20photos/05-01%20Winter%20Walk/ Good pics of Moosehead Lake and surrounding area. "And if we live, we shall go again, for the enchantment which falls upon those who have gone into the woodland is never broken." Looks like a fun trip. Alot of nice photography. 200 miles is quite a walk in the summer, let alone winter. Looks like a nice setup with the canvas tent and sheet metal stove, be fast the heat up at night. Do these people have sponsors? I wonder how they make a living hiking in the woods. I take it's like vacation time from their regular jobs. It's none-the-less very interesting and not many would be as adventurous to take it on. I'm always walking in the woods in winter, but I like my warm bed in the house. It is their regular jobs. They're Registered Maine guides and do this for a living winter camping and summer canoe river trips. All the necessary info is at their web site. I'm with you about a warm bed, and it just don't have to be at night. I like my afternoon naps when ever I can grab one. That's quite interesting how anyone could make a living at that type of guiding. Here in New Brunswick its for game hunting mainly, although I'm sure there are some who have tried the out door expedition guiding, especially on the Restigouche and Nepisiquit. But, in my area you'de starve to death before the end of the first month. People are more likely to head to Labrador, Quebec, Alberta and BC for outdoor expeditions. Those provinces subsidize such ventures. In New Brunswick, tourism is what you make of it on your own. The province has a very low budget in that department. In New Brunswick, tourism is what you make of it on your own. Maine is coming along good with tourism in so many ways...people around here "DO" make it happen!! Just to mention a couple... snow is "white gold" in these parts. Now this kind of sport "wilderness walking" one can only wonder if this could maybe even possibly turn into an olympic event who knows?? It takes a lot of volunteers and leadership but good things can happen when people put their minds to a task. It sure shows around here. Having small and large parcels of woodland, open land, owned by private and public entities, and a willingness with everyone to share the great outdoors is a big plus for northern Maine. The "Last Wilderness of the Northeast" has got a lot to offer. A working forest and recreation has worked in the past, why should it not continue as such?? Lots of people thought that Eco Challenge would end up as an Olympic event, but it didn't happen. Here is a couple of pics of my winter walk on Friday. 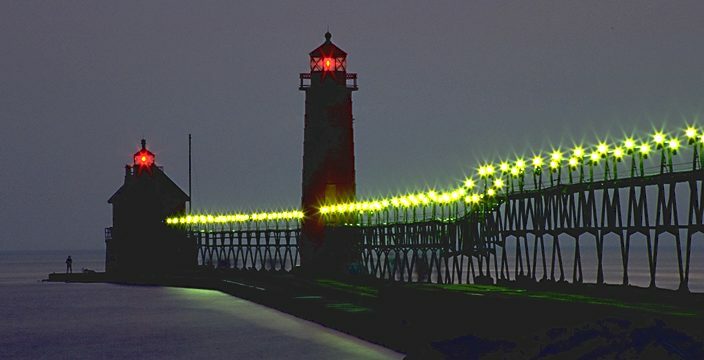 This is Lake Michigan at the Grand Haven Pier. I had some film to use up, so I headed out to the lakeshore. Ran off 4 rolls of 35mm, and 4 dozen digital pics. The better pics are on the 35mm, so it will be a while before I can post those. Might head back out there later today for some more pics. One more, this is one of the ice arches that are out there. Cool, cool stuff, Furby! I especially like the sunset on the bottom there, with the lighthouse sitting there. I have an even better one set as my desktop background. My kid brother and I just got back from the lake again. This stuff is melting FAST!!! You couldn't even walk some places I did on Friday. The bergs were calving off right in front of you. Still there were a few idiots out on the dangerous stuff. Some people have to learn the hard way I guess. There is a pretty good sized ice flow right now, moving from there Northward. One guy was out in his sea kayak playing in the bergs. Pretty cool, kinda makes me wish I had gotten a bigger kayak after all. Ran off two more rolls of 35mm, and would have done more as there were some real nice shots, but way to many people! Might go back some cold clear day when nobody will be out there, just so I can get the shots I want. The sun is at a real nice angle this time of year. Edit: This is my current desktop background. Those are some great shots Furby, what is the metal work in your last one used for? Yes nice pictures furby. I forgot to take to digital yesterday on my walk along the NB trail. At the mouth of the Tobique River there are mounds of ice that popped up as if an air bubble pushed it out. These mounds where at random across the width of the river. I think it comes from swells under the river, there is a strong undercurrent that is generated from the flow of water through the dam. 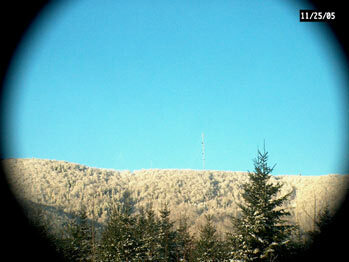 No sign of melting here yet, just on the on the top layer of snow in the warm sun. Some small streams have been open all winter. Good stuff, Furby! I'd love a copy of some of those pics...it's be fun to use them as a desktop too! Beautiful stuff! I made it out to the Lake today--no camera though, and besides, it was pretty cloudy and dreary. Yet amazing nonetheless. I ended up out at Kirk Park, which is my favorite Lake Michigan beach, though you don't have the lighthouse there. It's so cool seeing the ice mounded up on the shoreline, making it look like there's a mountain range out there. It's a very desolate scene, and good for the soul! But you're right--it's clear it's melting fast. I hope we get some more cold spells before we're through! I really want to get out to one of the channels when they're packed with tons of little bergs. I just love that sound, especially on a windy, cold day! Have you been downtown recently? The water's opening up, and by the Pearl St. bridge, there are two open channels on either side of the river, making the middle look like a mini Antartica! Cool, cool stuff! Yep Paschale, was down at the Sixth St. Dam on Thurs. Water is going down and you can see the dam, even though the river is still packed solid with ice. There are lots of openings here and there, but they are opening and closing as the ice moves. A little more warm weather and all that ice will break up and flow downstream. The channel at Grand Haven was totally free of ice. Of course if ya look at a good map, it would take a fair amount of ice to make it's way that far down stream do to the bayous and stuff. Before going to the pier, we stopped to the Rosey Mounds Natural area just south of there. We walked out to the lake, but there really was not much ice. I think there tends to be a lot more around the breakwaters and piers due to the way it traps the ice and water. Most of what is still out there will just freeze back together if it gets cold enough again. It would take some good size storms and real cold weather to pile it back up again. Glad ya had a chance to make it out there! I can send ya a pic via email if ya want, or wait and see what I get off the 35mm. SD, Did it look a bit like small mouguls for skiing? Norm, The metal work or catwalk now carries the power for the two lighthouses, and also acts as a marker for the pier. Each upright has a pair of lights mounted at the top of them, and serve to show the location of the pier. It's original use was to allow access to the light houses during storms and in the winter. I wouldn't recommend walking or skiing anywhere near them. They remind me of air holes made by seals, only thicker ice and larger uplifted mounds. Right, I was just trying to get a mental image. Well, we'll have to wait 'til the boss gets his new image upload thing sorted so I can post a drawing. Honest boss, I ain't complaining. Thanks for the links Furby, some interesting history and some neat pics too. A link to some pictures of the last part of the "Winter Walk" down the frozen Saint John river. Really does look like fun. With that kind of equipment, the hardest part of whole deal sounds like just dragging it around. Well, better get used to it. Winter is here. The Winter Walk is supposed to start from up this way and end in Greenville... with all this snow I don't think it'll be "just dragging it around"... it'll be more like swimming it around... cause every time I stepped of the Bearcat (snowsled)this past week I was swimming!!! You hang in there pappy , you live in a beautiful area . I havent been keepin up like I should but I know your log cabin was done and did you build anymore of those guest cabins this last year ? Its a different winter here this year as there is problems on most of the lake ice and that is too much snow and flooding and thin spots . Makes it tough to ice fish . Happy New Year pappy !